We are weeks away from the gloriousness of fall, meaning it’s only a matter of time before we can roll around in tweed and scarves and not get asked to leave The Gap. But you can’t walk into these situations unprepared. Granted, if you’re reading this, you’re probably not (the September issues are out, and it’s basically go time), but just to make sure we’re all on the same page, we've rounded up the top 10 Fall 2013 fashion trends to make sure the season is yours to conquer. It’s difficult not to, but don’t fear capes – how can you, they’ve sustained themselves through the Victorian era, the 1940s, 1960s, and now, 2010s? They’re also versatile: as proven by Valentino’s winter white offering (which is beaded and calf-length) and Jill Stuart’s RTW classic black piece (which she paired with trousers and oxfords), a cape can carry you through the season and various events. Merely treat it as you would a coat, and remember that if your grandmother could do it when she was young, so can you -- just like Lily Allen and Kate Hudson did in 2010. Back-to-school is synonymous with fall (obviously), but this time around, we grown-ups aren’t being left out. Case in point: collections by the likes of Tory Burch, who saw crisp button-ups layered underneath cardigans and worn with tweed pants. 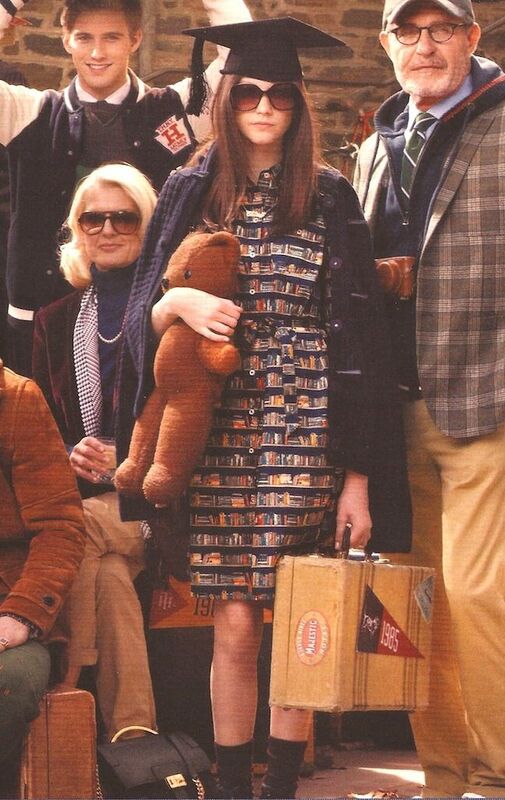 Meanwhile, the king of collegiate, Tommy Hilfiger, showcased a collection chalk-full of argyle suits, knit sweaters, and even a book print dress (though for the record, it’s tragically next-to-impossible to find online). It’s been more than a few years since thigh-high boots re-introduced themselves, and this season is just another testament to their staying power. (Which makes sense – winter is cold, you guys, it’s okay to cover up.) On the celeb front, Heidi Klum recently donned a suede style in the spirit of Emilio Pucci’s collection, while Miley Cyrus has made headlines in hers. Though breathe easy, flat aficionados: you can wear a smaller heel or even a flat style if you’d rather not risk tumbling to your death like some of us would. The best kind of fashion lives forever, and adding to 2013’s eclectic nature is the season’s mod influence, which infuses capes, thigh-high boots (good news, us: it all ties in!) with bright colours (like Lisa Perry’s loud dresses) and Twiggy-inspired mini-dresses (as found in Temperley London’s RTW collection). But in addition to flipping through old fashion magazines and scrolling through Tumblr, you can also look to someone like Alexa Chung who’s been embracing the vintage vibe for many moons now. The vintage throwback continues with pleated skirts which borrow from the ‘70s and early ‘80s with their high waists and pleats. Calvin Klein infused this look with the season’s leather trend (which we’ll get to imminently), while Celine did the same. However, earlier this year, Diana Argon showcased Marc Jacobs S/S take on the trend, opting for a floral pattern and ‘50s style which there’s still plenty of room left for as we ease into autumn. Finally, fashion and function merge in the season we need them to the most. 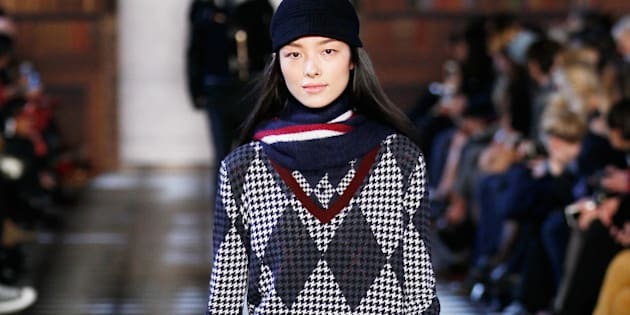 Tommy Hilfiger featured beanies in droves in his F/W collection, while BCBG Max Azria did the same, thus finally offering a reprieve from hatless-ness in freezing temperatures. (Yes, we’re concerned about the cold. We’re adults – this is how it works.) Meanwhile, styles like fedoras, bowler hats, and this also found places within the Fall 2013 landscape, thus making “hats” and all that the word embodies a go-to autumn trend. When we say academic, you say tweed (“academic!” – “tweed!” – “academic” – “tweed!”), so with an influx of collegiate-inspired styles, we probably all expected to see menswear fabrics and patterns in droves, as is the true autumn way. Chanel dressed up the fabric in their Haute Couture collection through skirts and suits, while Alice + Olivia ran with argyle and plaid. Not that any of this is new: in 2010, Claudia Schiffer kept on-point with an argyle V-neck, making us wish we’d kept our vests from high school. Declared the “it” colour of 2013 back in January, emerald green clearly stuck around for its F/W hurrah, appearing in collections by Phillip Lim, Pantone, and Carolina Herrera. This, of course, is after Emily Blunt wore it in 2012, and Sofia Vergara rocked the colour in June – thus ensuring that incorporating an emerald top, accessory, or a dress still gets a green light (eh?) this fall. Where the rest of autumn sees fitted pieces, outwear remains at large. Following in the footsteps of capes are oversized jackets, which pay homage to the late ‘80s and early ‘90s. (Think of Kevin McAllister’s mom in the original "Home Alone.") Designers like Michael Kors used the look to capitalize on the menswear trend, while Mulberry kept their pink jacket relatively fitted – much like Kate Bosworth’s boyfriend jacket from a couple seasons back which she paired with leather pants. We all have leather gloves, leather footwear, and a leather coat (which you can pick up for next-to-nothing at thrift stores if a new model is too pricey), but what about leather … everything else? In the spirit of Ross Geller, designers have clung to the fabric in droves, with everyone from Chanel (see: the aforementioned leather skirt) to Vionnet (loose-fitting leather pants) to Mulberry capitalizing on the leather look. You can do the same: even a leather-embellished t-shirt makes a good wardrobe staple, and again, a thrifted leather car coat from the 1970s will keep you on-budget and autumn-ready.